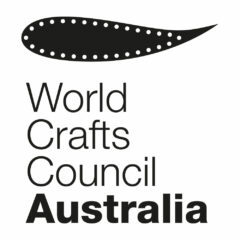 As a member country of the World Crafts Council Asia Pacific, Australia is involved in the development of the Encyclopedia of Crafts in the Asia Pacific Region. This volume is designed to promote living craft heritage in a rapidly developing part of the world. This prompts the question – what are Australian crafts? Other countries of the Asia Pacific, such as India and Japan, are blessed by a treasury of unique craft traditions. Australia does not have the same depth of traditions for a complex of historical and cultural reasons. Yet part of national identity is the understanding of what makes a culture unique in the world. In sport, Australia has a unique code of football, as well as particular prowess in cricket and rugby. Crafts are intrinsic to the idea of a civilisation, which involves the evolution of techniques for manipulating the material world. Different cultures have make distinct contributions to this, such as Japan’s understanding of textile dyeing, or China’s skill in porcelain ceramics. But as part of our living heritage, crafts are also vulnerable to neglect. We are familiar with this situation in the Australian languages. The loss of Aboriginal languages in Australia is relatively irreversible. When a language is forgotten it diminishes our ways of understanding the world. In the same way, loss of skills in manipulating materials reduces our expressive capacity. If we lose the technique of weaving grass, we no longer have that material in our artistic repertoire. Australian crafts represent what we make of the material world in which we find ourselves. As a settler colony, there has been pressure to limit our energies to materials used in the ‘home country’, such as fine European timbers, precious metals and gems, willow and porcelain. By contrast, Australian materials can seem crude and unwieldy. Rather than re-create an imitation Europe, the Australian challenge is to accept our environment and learn to appreciate its creative potential. Pre-contact crafts are tied to traditional Aboriginal practical and ceremonial needs. These involve purely Australian materials and are unique. The fibre fish trap is an example of this. Settler/missionary crafts involve the adaptation of indigenous traditions to the materials and techniques introduced by European settlers. These include the adaptation of fibre skills to basketry in central Australia. Modern crafts are more internationally engaged as part of the studio movement that began in the 1960s, where craft involved the production of original art works. There are practically no unique forms in Australia, though there are particular strengths and distinct trends, such as Susan Cohn’s aluminium metalware or Klaus Moje’s coldworking glass technique. So what would Australia’s entry be in the craft encyclopedia? Is there anything missing? Comments are most welcome. I’d like to see embriodery, piecing and quilting and related crafts added to the list. Australia has a well extablished network of groups sharing and building their craft skills in these areas and provide women in particular, social and economic opportunities through workshops, retreats and markets. Similarly the most traditional knitting, crochet and lace making, having seen a resurgance of interest and engagement over the last few years deserve at least a mention on your list of crafts practiced in Australia. All have the potential to build on the traditions of our society and link us back to our past and the experineces of others. Thanks for that feedback. That’s an important point and it will be addressed. A good point. The exhibition by Lola Greeno travelling around Australia is great testament to the vitality of this craft. My wife and i going to immograte to australia ,is there any job opportunity for taking and reside there. I mean is it possible to subsist there by handi craft. Can you say what kind of handicraft you know?